Since August 2016, Ms. Wellmann has been our always cheerful and versatile trainee. She spreads positive energy, which not only sweeps our practice team along, but also jumps over to the patients. For the holistic well-being of our patients Mrs. Wellmann also takes care of her empathetic manner before, during and after the treatment, which is rounded off by her concentrated way of working and her prudence in chair assistance. 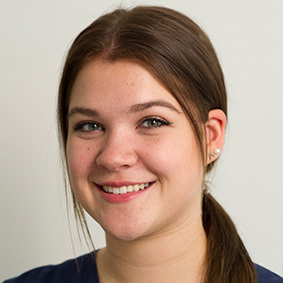 Besides her passion for dentistry and working with patients, to whom she always gives a good feeling, Mrs. Wellmann is enthusiastic about carnival and show dancing and was even allowed to call herself German champion of self-defense. The strength and balance that she draws from her sporting leisure activities benefit both the patients and our entire practice team. We are happy to have Mrs. Wellmann as a trainee in our team.